Alberta’s farms and ranches are home to so much more than livestock and crops. From dung beetles to deer, crocuses to spruce trees, countless wildlife species live and thrive on agricultural land. In fact, the more diverse a farm or ranch is in plants and animals the more agricultural producers benefit. It is a win-win for producers and ecosystems. Learn how biodiversity helps with productivity, pest management and enduring floods and droughts. Develop the skills and tools necessary to help wildlife thrive on your land without sacrificing financial gains or productivity. Discover how the benefits of biodiversity also apply to diversifying the annuals you plant and the livestock you raise. – Marian Weber – Alberta Innovates Technology Futures. This afternoon workshop will be led by experts in the field and Jerremie Clyde, owner of Little Loaves Farm. Jerremie and his wife Rita grow and maintain a mix of pasture, woodland, annual crops, and perennials with views to the Rockies in the West. They have been farming in Alberta for over a decade. We hope you can join us in Sundre for a day of fun, making new friends and learning how the interactions of wild and domesticated species are integral to a successful farm. 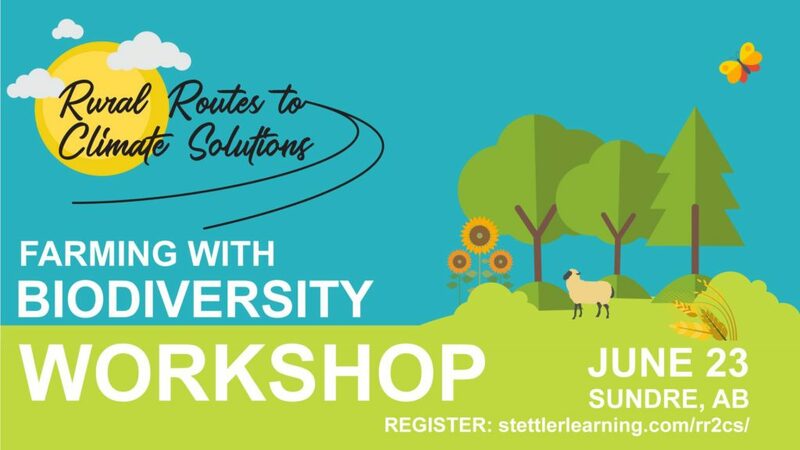 Rural Routes to Climate Solutions (#RR2CS) is a program of the Stettler Adult Learning Centre. We empower agricultural producers in Central Alberta with climate solutions that benefit farms and ranches. Our partners include Organic Alberta, Young Agrarians and many farmers across the province!